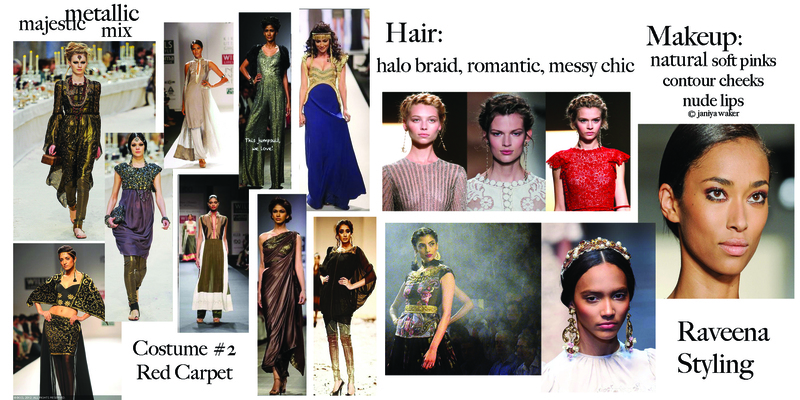 In designing a recipe for world fashion, in following suite with Indo-Western culture, my formula for look #2 for my client in Mumbai, I've decided to stay true to the cultural appeal with a modern vision. As displayed in the moodboard, my color of choices are all about shiny metallics and feminine embellishment. I chose to focus on: gold, copper, and iridescent ombre colors from cool to warm, with pops of vibrant hues like purple, and cobalt icy tones for a bit of a majestic finish to translate an air of "royalty." With a carefully sought-out direction on how to take my clients brand to the next level, my motivation was somewhere in the realm of Indo-Western (by request) and applying a touch of my own sparkle to the mixture. My ever-inspiring list of LA clients range from International couture labels, to independent fashion designers, to London-based showrooms and local LA style houses. Within this wide spectrum of ensembles and influences, the skies truly the limit. With a project so captivatingly special, I opted to get in touch with some of my most celebrated go-to labels here in LA - to discover their participation in "Wills Fashion Week" home to some of the most exquisite fashion labels in the South-Asian Indian market. If you love fashion, one musn't sleep on Indian Fashion Week. Much like the international markets: NYFW, LFW, PFW, India's "WIFW" also takes place two times per year. Covering both seasons: Fall/Winter and Spring/Summer. Their seasons fall approximately around the time of the year that our (end of the market) market's run. With a wide array of newfound inspiration, I set out on a visual journey to research all that can be accomplished remotely from LA to India. Overall, the goal is to transform a traditional staple piece of clothing into something that plays homage to the original, but takes it to the next phase in fashion. In building a marketable presence for my client, following tradition is important for her culture, but stepping outside of her comfort zone is equally appealing for her genre of music as well. To design an image that is equally yoked in both sensibilities is vital to the complete production. In working with one of the most fashion favored capitals in the international markets, moving a brand from India to the United Kingdom - it's important to cross cultivate both cultures musically and visually. We decided collectively to follow a less bohemian inspiration for the look and mood of our second style option, and continue to enlighten the Western world on how to wear a traditional Tika headpiece, in a non-traditional fashion for one of the key style transitions. Sleeveless dresses with high-neck collars. In gelling each of these looks from #1, to #2, and moving onto wardrobe change #3, the mission is to fuse each one with an alternating season. Look #1 begins sort of spring and summer with golden white tones and soft pastels, moving into fall and winter with metallic shades and jewel tone contrasts. In my mind the perfect way to showcase a moving spectrum of fashion along with the seasons change, and the trends that follow. Carrying into the third (and final) fashion look, we begin to see more color, and bolder, brighter fashion statements as we begin to transition into Spring Summer 2013. Just in line with the global trends, and just in time to launch her second single from the album.